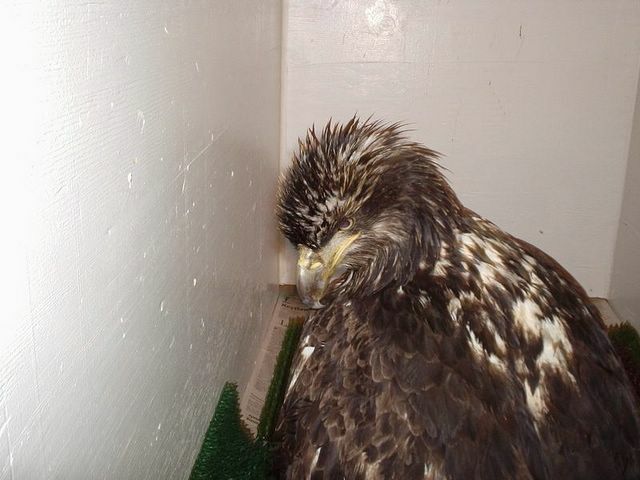 This immature bald eagle (BE 05-16) suffered some severe head trauma while in Dutch Harbor. Dr Todd Palmatire and Cindy picked her up at the Anchorage Airport around 4:30 PM last night. Thanks again PenAir. She's huge for he age. The primary feathers on her wings have quills at least 1/4 inch thick. She flew into something hard. She has some permanent damage to her right eye. She also gave USF&W a hard time. While she was avoiding capture, she jumped into the Bering Sea. They had to go fetch her. She was a little wet still and a little cold when she arrived. She had that head trauma, head tic so we gave her a shot of dex. No other problems were noted in her exam. She weighed in at 5.18 KG with a full keel. Placed her in a warm mew with fresh water and some moose meat. Let's see how she is doing in the morning. Older PostI feel much better thank you!